"American Indian Basketry No. 12"
written by Marvin Cohodas Ph.D.
Datsolalee was a very talented basket weaver. In her lifetime she made over 250 baskets. Many of these baskets are in museums all over the country. The pattern of each basket had to be planned very carefully. For even if one strip was out of place the pattern would be ruined. But Datsolalee's baskets were done with perfection and outstanding workmanship. This was miraculous considering that she was almost blind. Datsolalee's real name is Louisa Keyser. 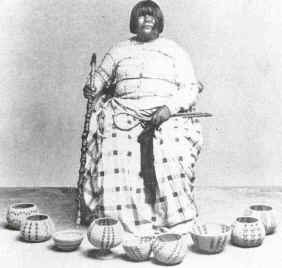 Her Washoe Indian tribe in Nevada gave her the name Datsolalee which means "The Queen Of Washoe Indian Basketmakers." They gave her this name because they were very proud of her work and accomplishments. Fame and recognition were two things that Datsolalee achieved in her lifetime. She was recognized by her Indian tribe and those societies that were non-native as well. Her pieces were very well made and highly prized as collectors items. But this success was not easily or swiftly achieved. Datsolalee lived in a time when her tribe was losing everything they valued. They were being forced from their land, they were losing their power, and they felt hopeless standing against the government. Yet even in hard times Datsolalee remained optimistic. She was very proud of her craft and she did all she could to use it to her benefit. During these hard times, Datsolalee worked as a maid and created baskets in her spare time. She worked for Amy and Abraham Cohn. They were the owners of The Cohn Emporium; which was a men's clothing store. Amy was fascinated by Indian culture, especially basketry. 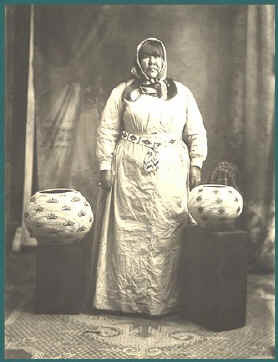 Under Amy's direction, the Cohn's obtained a large collection of Washoe baskets; as well as works from other tribes. Then, they sold these works to interested buyers. When they discovered there was money to be made they brought up all the available pieces and commissioned weavers to make more basket to sell. Louisa was one of these weavers. She was encouraged to devote as much time and effort as possible into basket weaving. The Cohns were so impressed with her work that they offered her full patronage in return for the ownership of her baskets. Louisa and her husband, Charlie Keyser, were supported for more that 25 years by the Cohns. Traditional, was not a word that anyone would use to describe Louisa's baskets. She single-handily changed the art of Washoe basket weaving. She changed and refined the stitching technique to create a new shape of basket called, degikup. 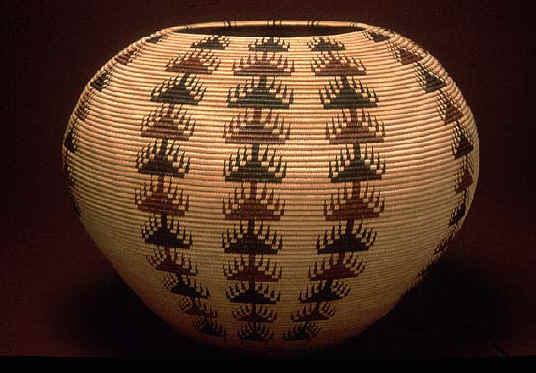 Degikup was a larger basket which curved in towards the top. She also expanded the design to cover most of the basket surface. Then, she introduced a dye called, Redbud. This was used along with a black dye for decoration. Louisa was also influential in establishing the direction for the new curio style and the three coil method as well. Her baskets were continually evolving into many forms and designs. Some say that these changes were made mainly to increase sales. Others say that her work can be describe as, "art for art's sake." However, many weavers imitated her work and through her innovations she changed the art of Washoe basket weaving forever. Davis, A.P. and Selvidge M. J. (1995). Focus on Women. Huntington Beach, CA: Teacher Created Materials, Inc.
Porter, F.W. (1990). The Art Of Native American Basketry. Westport, CN: Greenwood Press. Turnbaugh, S.P. and Turnbaugh, W.A. (1986). Indian Baskets. West Chester, PN: Schiffer Publishing. Dat So La Lee at the Emporium Co.